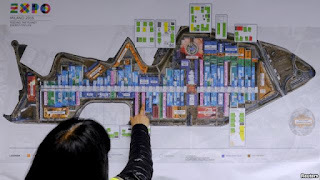 A visitor looks at an Expo map inside the Expo 2015 work site near Milan, Italy, April 27, 2015. Culinary tourists are pushing growth in foreign tourism to the United States, which is transforming its image as a fast-food mecca to a land of regional tastes and dishes, said officials visiting the Expo 2015 world's fair focusing on food this week. Foreign tourism to the United States in 2014 rose by seven percent to over 75 million, contributing $221 million to the economy, according to Christopher L. Thompson, president and CEO of the Brand USA, a private marketing organization created five years ago to promote the United States as a destination. That's on the way to the Obama administration's goal of attracting 100 million visitors by 2021, from 55 million in 2012. The boost coincides with Brand USA's culinary initiative to make food one of the country's main selling points, including the creation of guides for top culinary destinations, videotaped chef vignettes for its Discover America web portal and sponsorship of the Food Truck Nation food concession at Milan's Expo world fair, which is expected to attract at least 20 million visitors. In the second year of the culinary focus, food rose to be among the top five reasons for choosing the United States as a destination, officials said. "We've recognized culinary as a real driver of tourism, with all the diversity that the United States offers," Thompson told The Associated Press. "It is becoming one of the reasons that people are coming to the United States. Daniele Catania, who runs the Alidays travel tour operator that organizes tours for Italians in the United States, said he has started creating itineraries guided by food. "Food is like a language. You can learn a lot of history through food," Catania said. Thompson said Brand USA's goal is to attract visitors not only to cities well-known for their cuisine, but also to smaller towns and rural areas that also have food stories to tell. "Palates have no boundaries," said Dorothy Cann Hamilton, founder and CEO of the International Culinary Center and president of the Friends of the USA pavilion. She declared the days that the hamburger defined American food as bygone, saying American cuisine is developing regionally, with strong immigrant influence. "We don't think the rest of the world understands how regional tastes are," she said. "If you are Vietnamese and living in New Orleans you are eating a lot of shrimp. You won't necessarily see that in New York."